A human services bachelor’s degree online prepares you for a rewarding career helping people and communities with the challenges of life. The human services field encompasses various industries and career paths. Combining knowledge and skills from a variety of disciplines, human services workers evaluate a client's needs and create and implement a plan for services. Human services professionals help people of all backgrounds, including people with disabilities, people with addictions, homeless people, veterans, immigrants, adults, seniors, and children. What is a Bachelor’s in Human Services Degree? What is the difference between a degree in Human Services and Social Work? How much does someone with a Human Services degree make? What types of jobs can I do with a Human Services degree? What is the job outlook for those with degrees in Human Services? Are there professional associations for individuals working in Human Services? We selected the online human services degree programs based on the quality of the program, the types of courses offered, the faculty, rankings, awards, and reputation, including the school's reputation for effectively providing online degree programs. Northeastern University ranks #1 on The Best Online Bachelor in Human Services Degree Programs! The College of Professional Studies at Northeastern University provides career-minded students with a variety of undergraduate, graduate, and professional options for study. Catering to the needs of professional and non-traditional students, the programs in the college focus on the development of necessary professional skills and knowledge for success. The College of Professional Studies offers an online Bachelor of Science in Human Services degree program which prepares students to pursue a variety of careers in a variety in the human services field. The program focuses on fundamental concepts in human services. Students develop a foundation of practical and theoretical knowledge and skills necessary to human services practice. The program engages in social psychology, social welfare, case management, and more. Students in the online human services online degree program must complete a practicum and a capstone project. UMass Online ranks #2 on The Best Online Bachelor in Human Services Degree Programs! With a wide variety of undergraduate, graduate, and professional programs available, UMass Online serves the needs of a diverse body of non-traditional students. UMass Online Specializes in online education for busy adults. UMass Online offers an online Bachelor of Arts in Human Services Concentrations degree program that prepares students to pursue a variety of careers in the human services field. The program emphasizes the need for a balanced foundation of theoretical and practical knowledge in the field. Acknowledging that students with prior professional experience have already gained knowledge from their work, the program awards credit for life experience on an individual basis. The program prepares students for a variety of professional settings in the human services field. The online human services degree program requires 120 credit hours. As a degree completion program, specific coursework and requirements vary based on the prior academic and professional experience of the individual student. The program requires students have at least 12 transferable college credits prior to admission. UMass Online is accredited by the New England Association of Schools and Colleges (NEASC). Western Washington University ranks #3 on The Best Online Bachelor in Human Services Degree Programs! The Department of Health and Community Studies at Western Washington University provides students with a handful of undergraduate and graduate options to study fields relevant to human services. Housed in the Woodring College of Education, students benefit from the College's research and outreach programs, including the Center for Education, Equity, and Diversity, gaining valuable experience and connections. The Department of Health and Community Studies' Bachelor of Arts in Human Services online degree program prepares students to pursue a variety of careers in the human services field. The program emphasizes key aspects of human services practice, including diversity and social justice, program planning and evaluation, applied research, interviewing, case management, and more. Students in the Human Services degree program develop a balanced foundation in practical and theoretical approaches to human services. Students emerge with the knowledge and skills necessary to succeed in diverse professional settings. Students in the online program must complete an internship. Western Washington University is accredited by the Northwest Commission on Colleges and Universities (NWCCU). Indiana Wesleyan University ranks #4 on The Best Online Bachelor in Human Services Degree Programs! One of four schools at Indiana Wesleyan University, the School of Service and Leadership provides students with undergraduate, graduate, and professional options for study in a variety of fields, all devoted to serving individuals and communities. Building on the Christian mission of the University, the School of Service and Leadership integrates biblical principles of service into its many programs. The School of Service and Leadership offers an online Bachelor of Science in Human Services degree program for students who already earned a significant amount of college credit and need to complete their degree. The program provides a focused study of the many roles of human services professionals in public and private organizations. The curriculum develops knowledge and skills in key areas of the field, including developmental psychology, addiction counseling, advocacy, and case management. Students prepare to pursue a variety of human services careers. Students must have at least 60 transferable credit hours from an accredited program to gain admission into the online Bachelor in Human Services program. Once admitted, students may earn their degree in as few as 20 months. Old Dominion University ranks #5 on The Best Online Bachelor in Human Services Degree Programs! Housed in the Darden College of Education at Old Dominion University, the Department of Counseling and Human Services offers undergraduate, graduate, and professional program options for students interested in the field. With numerous internship opportunities, the Department maintains a commitment to giving students the experience and education necessary to pursue or advance human services careers at all levels. The Department of Counseling and Human Services offers an online Bachelor of Science in Human Services degree program that prepares students to pursue careers in the human services field. The program investigates the roles of human services professionals in regards to the agencies they work for, as well as the clients they serve. The online Human Services degree program emphasizes important aspects of the field to develop a balanced foundation in human services theory and practice. Students engage in coursework which covers diversity issues, substance abuse, family counseling, case management, and more. Students in the online program must also complete an internship. St. Joseph's College New York ranks #6 on The Best Online Bachelor in Human Services Degree Programs! The Department of Human Services at St. Joseph's College New York provides students with an undergraduate degree and certificate programs for the study of the human services field. Whether serving incoming freshman, university transfers, or experienced working students returning to complete a degree, the Department of Human Services meets the educational needs of a diverse student body. Through the SJC Online platform, the Department of Human Services offers an online Bachelor of Science in Human Services degree program that prepares students to pursue careers in the human services field. The program emphasizes key aspects of human services practice. Students develop a balanced foundation in theoretical and practical knowledge necessary to the profession, including human services administration, group dynamics, counseling, case management, and more. The program builds blends the human services foundation with a liberal arts foundation, ensuring students emerge well rounded. Students in the online human services degree program must also complete a capstone project, and may complete a practicum. St. Joseph's College New York is accredited by the Middle States Commission on Higher Education (MSCHE). East Tennessee State University ranks #7 on The Best Online Bachelor in Human Services Degree Programs! The Department of Counseling and Human Services at East Tennessee State University provides students with a variety of undergraduate and graduate options to study the human services field. Housed in the College of Education, the Department draws on the resources and expert faculty of the College, with a focus on addressing needs across the lifespan. The Department of Counseling and Human Services online Bachelor of Science in Human Services degree program balances coursework with plenty of real-world experience. The program provides students theoretical and practical knowledge to help them succeed in a variety of professional settings in human services. Students must also pursue a minor in a related field, such as Family Studies, or Appalachian Studies. Students must complete a practicum and internship. East Tennessee State University is accredited by the Southern Association of Colleges and Schools Commission on Colleges. The Bachelor of Science in Human Services is accredited by the Council for Standards in Human Service Education (CSHSE). Colorado State University Global Campus ranks # 8 on The Best Online Bachelor in Human Services Degree Programs! The School of Professional Studies at Colorado State University Global Campus offers a variety of online undergraduate, graduate, and professional programs. The School of Professional Studies meets the educational needs of working and non-traditional students through flexible programs. The School of Professional Studies' online Bachelor of Science in Human Services degree program prepares students to pursue careers in a variety of professional settings in the human services field. The program provides a strong theoretical knowledge base, as well as essential practical skills. The online Human Services degree also comes with numerous options for specialization, spanning a wide variety of fields, including Criminology, Organizational Leadership, and Public Relations. Race, Gender, and Ethnic Relations in the U.S.
Students must also complete a practicum and a capstone project. Saint Mary-of-the-Woods College ranks #9 on The Best Online Bachelor in Human Services Degree Programs! The Department of Social and Behavioral Sciences at Saint Mary-of-the-Woods College provides students with numerous options for study, at all levels. Drawing on the College's rich history of women's education and catholic education, the Department of Social and Behavioral Sciences integrates the College's core values into its diverse selection of programs. The Department of Social and Behavioral Sciences' Bachelor of Science in Human Services online degree program utilizes an interdisciplinary approach to the study of the field. The program draws from sociology, psychology, and counseling to give students a strong foundation for human services work. Students engage in key aspects of the field, including ethics, casework, social problems, and minority community issues. Students prepare to pursue entry-level positions in human services in a variety of professional settings. Students in the human services online degree program must also complete two practicums. University of Wisconsin-Oshkosh ranks #10 on The Best Online Bachelor in Human Services Degree Programs! Growing from the teacher-training program that the University of Wisconsin-Oshkosh opened with in 1871, the College of Education and Human Services has grown alongside the University to offer a variety of undergraduate, graduate, and professional programs in multiple fields. Dedicated to producing the next generation of human services and education professionals, the College engages in research and outreach, giving students unique opportunities for advancement and exposure to their field of study. The Department of Human Services Leadership within the College of Education and Human Services offers an online Bachelor of Science in Human Services degree program which prepares students to pursue a variety of careers in the human services field. The program develops a balanced foundation in key theoretical and practical aspects of the field, including intervention, social issues, legal and ethical issues, and non-profit operation. Students gain real-world experience alongside classroom education. Students must also complete two internships. The University of Wisconsin-Oshkosh is accredited by the Higher Learning Commission (HLC). The Bachelor of Science in Human Services is accredited by the Council for Standards in Human Service Education (CSHSE). USC Palmetto College ranks among Top 20 on The Best Online Bachelor in Human Services Degree Programs! An online wing of the University of South Carolina, Palmetto College provides non-traditional students with numerous bachelor degree completion programs across a diverse selection of fields. Dedicated to meeting the unique needs of non-traditional students, the programs at Palmetto College emphasize a blend of practical knowledge with the theoretical, toward the goal of career-ready graduates. Palmetto College's online Bachelor of Science in Human Services degree program provides an interdisciplinary, liberal arts approach to the study of the field. Students engage in coursework that draws heavily on psychology and sociology as a foundation for human services. The program places a strong emphasis on real-world experience and practical knowledge and skills to balance its theoretical background. Students develop the skills necessary to serve a diverse population of individuals and groups in meeting their unique needs. Students must complete three internships and a capstone project. As a degree completion program, the online Bachelor of Science in Human Services program requires students to have at least 45 hours of college credit prior to admission. The University of South Carolina is accredited by the Southern Association of Colleges and Schools Commission on Colleges (SACSCOC). 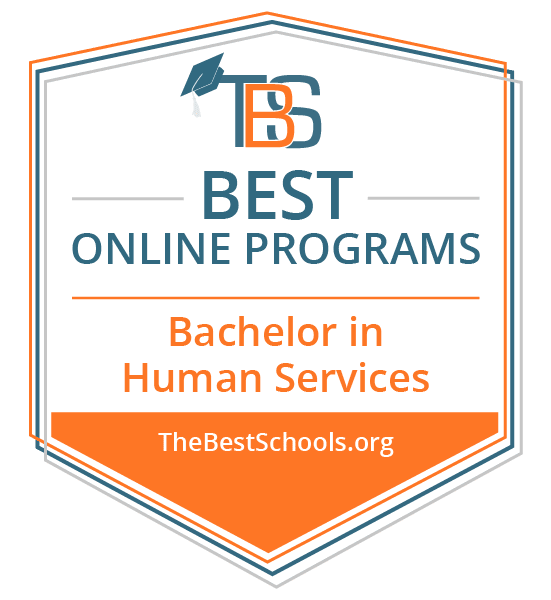 Judson University ranks among Top 20 on The Best Online Bachelor in Human Services Degree Programs! Offering undergraduate and graduate programs, the Division of Professional Studies at Judson University serves the unique needs of non-traditional students who seek to advance their careers through education. The Division of Professional Studies advances the University's Christian mission through a strong Christian foundation built into the core of its many programs. The Division of Professional Studies' online Bachelor of Arts in Human Services degree program prepares students for entry-level positions in the Human Services field. The program develops a strong, balanced foundation in theory and practice of the field. Students engage in coursework which covers key aspects of human services, including individual and group intervention, advocacy and social justice, multicultural perspectives and issues, and social welfare. Backed with a Christian perspective, students develop the skills and knowledge necessary to serve people and communities in public and private sector positions. Students in the online Bachelor in Human Services program must also complete a field experience and capstone project. Judson University is accredited by the Higher Learning Commission (HLC). Anderson University ranks among Top 20 on The Best Online Bachelor in Human Services Degree Programs! Christian Anderson University's College of Health Professions provides students with a variety of options for undergraduate, graduate, and professional study. With numerous online and hybrid program options, the College of Health Professions meets the needs of students from diverse backgrounds. The School of Allied Health in the College of Health Professions offers an online Bachelor of Human Services degree program, with an optional Behavioral Science concentration. The program incorporates a Christian perspective to examine social issues, issues of the field, and ethical and professional values in professional practice. The coursework develops a strong foundation in key aspects of the field, including case management, and theory of human services, and intervention. Students prepare for careers in the field in public and private sector positions. The human services online degree requires 120 credit hours. The courses utilize an eight-week format. Anderson University is accredited by the Southern Association of Colleges and Schools Commission on Colleges. Ottawa University ranks among Top 20 on The Best Online Bachelor in Human Services Degree Programs! With a liberal arts core, the School of Arts and Sciences at Ottawa University provides a variety of undergraduate, graduate, and professional programs in numerous fields. The School emphasizes liberal arts values across the board in its programs, developing students into knowledgeable graduates with diverse backgrounds of knowledge. Its numerous online options make education available to many non-traditional students. The School of Arts and Sciences offers an online Bachelor of Arts in Human and Social Services degree program for students who wish to pursue entry-level positions in the field. The program develops a balanced foundation in the theory and practice of human services professions. Students engage in key issues, including social welfare, diversity and multicultural relations, family, substance abuse, and social policy. Students develop the knowledge and skills necessary to successfully work in the public and private sectors of human services. LeTourneau University ranks among Top 20 on The Best Online Bachelor in Human Services Degree Programs! With a variety of professional and undergraduate programs, the Department of History, Political Science, and Criminal Justice at LeTourneau University offers students several options to study these fields. In keeping with the mission of the university, the programs of the Department, as well as all of those in the School of Arts and Sciences, emphasize a Christian-centered education, integrating Christian values into program outcomes and coursework. The Department of History, Political Science, and Criminal Justice offers an online Bachelor of Human Services degree program that provides an interdisciplinary study of the field. Students engage in coursework which draws on psychology, sociology, criminal justice, and counseling. The program emphasizes key aspects of the field in combination with a Christian foundation. Students prepare for entry-level positions in the public and private sectors. Utilizing an accelerated format, each class in the program lasts five weeks. Quincy University ranks among Top 20 on The Best Online Bachelor in Human Services Degree Programs! With a variety of undergraduate and pre-professional programs, the Division of Behavioral and Social Sciences at Quincy University provides students with numerous options for study in the area. The Division, providing a strong liberal arts foundation with contemporary research and practice in the social sciences field, provides students with the education necessary to pursue numerous careers, as well as graduate study. The Division of Behavioral and Social Sciences' Bachelor of Science in Human Services online degree program emphasizes key aspects of the field, including counseling theory, case management, group and individual meetings, appraisal, needs assessment, and more. Students develop a balanced foundation of theoretical and practical knowledge and skills to effectively serve their clients. The program prepares students for entry-level positions in the human services field. Students in the online program must also complete a practicum. Quincy University is accredited by the Higher Learning Commission (HLC). Central Washington University ranks among Top 20 on The Best Online Bachelor in Human Services Degree Programs! The College of the Sciences at Central Washington University offers undergraduate, graduate, and professional options for study in a variety of areas in the sciences. Students have the option to study hard sciences, such as chemistry or physics, as well as social sciences, such as psychology or sociology. Its diversity of programs and departments provide students with numerous opportunities to grow and advance through interdisciplinary study. The Department of Sociology in the College of Sciences, provides a Bachelor of Science in Social Services online degree program, designed to prepare students for entry-level positions in the field. The program emphasizes key aspects of social services, including sociology and social theory, research methods, social welfare policy and inequality, and more. Students develop the theoretical and practical knowledge necessary to serve clients in a variety of settings. Students may pursue specialization through earning a minor from a related area outside of sociology, such as ethnic studies, or women's and gender studies. Students must complete a co-op experience. Central Washington University is accredited by the Northwest Commission on Colleges (NWCCU). Bluefield College ranks among Top 20 on The Best Online Bachelor in Human Services Degree Programs! The College of Professional Programs at Bluefield College provides career-minded students with numerous options to study and advance professionally. The College, catering to the needs of working adults and non-traditional students, offers online programs in multiple fields through its six departments, including the Department of Human Services, to help students prepare for the careers they desire. The Department of Human Services offers an online Bachelor of Science in Human Services degree program designed for students who wish to pursue a career serving others. The program emphasizes the key issues of social justice, diversity in service, and cultural dynamics in the human services field. Students in the Human Services degree program develop the knowledge and skills necessary to handle individual and group meetings, intervention, case management, and more. Students prepare to work in public and private sector positions. Bluefield College is accredited by the Southern Association of Colleges and Schools Commission on Colleges. Fisher College ranks among Top 20 on The Best Online Bachelor in Human Services Degree Programs! The School of Human Services and Health Professions at Fisher College provides undergraduate students with a variety of options to pursue education in the fields it represents. Committed to developing qualified, career-ready graduates, the School prepares students for entry-level positions in health and human services fields, as well as future graduate study. Through the Division of Accelerated and Professional Studies, the School of Human Services and Health Professions offers an online Bachelor of Science in Human Services degree program that provides an interdisciplinary approach to the study of the field. The program blends aspects of psychology, sociology, social work, and counseling to give students a complete foundation in human services practice. Students in the online Human Services program prepare to pursue entry-level careers in health care, community organizations, and social services agencies. Students develop knowledge and skills in key areas, including ethics, intervention. Students in the human services degree online program must also complete a senior project and an internship. Fisher College is accredited by the New England Association of Schools and Colleges (NEASC). Florida State College at Jacksonville ranks among Top 20 on The Best Online Bachelor in Human Services Degree Programs! The School of Health, Education, and Human Services at Florida State College at Jacksonville offers a variety of undergraduate options and professional certificates for students who seek to pursue careers in helping others. Ranging from early childhood education to radiology, the School caters to a diverse array of interests and needs, all focused on bettering communities through quality care and service. The School of Health, Education, and Human Services' Bachelor of Science in Human Services online degree program prepares students to pursue entry-level careers in the human services field. Students develop a foundation of practical and theoretical knowledge in key aspects of human services, including ethics, family treatment, group dynamics, multicultural perspectives, mental illness, domestic violence, and more. Students in the Human Services Bachelor's degree online program must also complete an internship. As an accelerated program, students can complete the online Bachelor of Science in Human Services program in 20 months. Florida State College at Jacksonville is accredited by the Southern Association of Colleges and Schools Commission on Colleges. Drury University ranks among Top 25 on The Best Online Bachelor in Human Services Degree Programs! Part of Drury University, the College of Continuing Professional Studies offers undergraduate and graduate programs designed specifically to meet the needs of busy, working, non-traditional students. With flexible online and part-time programs, as well as career and student services catering to working adults, the College helps non-traditional students secure the education they need to advance professionally. The College of Continuing Professional Studies offers an online Bachelor of Science in Human Services degree program with an optional leadership concentration. The program emphasizes key aspects of the human services field, including psychology and sociology, individual and family treatment, gender and sexuality, and ethical issues. Students develop the skills and knowledge necessary to pursue or advance human services careers in the public and private sectors. Drury University is accredited by the Higher Learning Commission (HLC). Shorter University ranks among Top 25 on The Best Online Bachelor in Human Services Degree Programs! The College of Adult and Professional Programs at Shorter University provides adult and non-traditional students with plenty of options for advancement through undergraduate, graduate, and professional programs in numerous fields. With many online study options, the College meets the needs of a diverse body of students through flexible programs dedicated to career-readiness and success. The College of Adult and Professional Programs' Bachelor of Science in Human Services online degree program prepares students to pursue entry-level human services careers in public and private sectors. The program utilizes an interdisciplinary approach, incorporating psychology, sociology, social work, and counseling. Students develop skills and knowledge in key areas, including case management, mental health and treatment practices, global and domestic issues, cultural diversity, ethical responsibility, and more. Students also gain additional specialization through a required minor in Criminal Justice, Sport Management, or General Business. Students must complete a practicum. Shorter University is accredited by the Southern Association of Colleges and Schools Commission on Colleges. Troy University ranks among Top 25 on The Best Online Bachelor in Human Services Degree Programs! The College of Health and Human Services (CHHS) at Troy University offers a variety of undergraduate, graduate, doctorate and professional programs for students who seek to serve their communities in a variety of healthcare careers. The College blends a professional perspective taught by subject matter experts with a liberal arts and science foundation so its graduates are prepared for a seamless transition from college to career. The College of Health & Human Services is committed to providing quality academic programs, in the health and human service disciplines, which are designed to prepare graduates who can function in an evolving community, health-based and social-service delivery system consistent with the professional standards established by each discipline. Through the development of knowledgeable, caring, responsive and self-directed graduates, CHHS is able to meet the health and human caring needs of a diverse and complex society. The College of Health and Human Services houses the School of Nursing, the School of Social Work and Human Services, the Department of Kinesiology & Health Promotion, and the School of Hospitality, Sport, and Tourism Management. Through numerous contracts, placements, internships and outreach programs, students have opportunities to gain hands-on experience as they earn their degrees in programs accredited by external accrediting organizations. The School of Social Work and Human Services offers a Bachelor of Science in Human Services online degree program designed to prepare students for entry-level positions in the field, as well as future graduate education. Students develop a strong theoretical foundation in human behavior in a social context, as well as the practical knowledge and skills necessary to serve clients and manage intervention. Students graduate the program ready to pursue careers in the public and private sectors in addition to pursuing graduate education in the human services and healthcare careers. The online human services degree program requires 120 credit hours. In addition to core and elective coursework, students in the online program must complete a minor and a practicum related to their chosen area of work. Troy University is accredited by the Southern Association of Colleges and Schools Commission on Colleges. In addition, CHHS holds the following accreditations at all levels of academic programs: Accreditation Commission for Education in Nursing; Commission on Accreditation of Athletic Training Education; National Council for Accreditation of Teacher Education; Council on Social Work Education; and the Commission on Sport Management Accreditation. University of the Cumberlands ranks among Top 25 on The Best Online Bachelor in Human Services Degree Programs! The School of Lifelong Learning at the University of the Cumberlands provides students with a select variety of undergraduate options for study in the several fields. In keeping with the mission of the small, private university, the School of Lifelong Learning integrates Christian principles into its programs, and provides plenty of online options to serve a diverse student body. The Department of Human Services in the School of Lifelong Learning offers an online Bachelor of Science in Human Services degree program, with options to concentrate in Human Services or Counseling. Students develop a foundation in practical aspects of the field, such as basic counseling skills, individual and family assessment and case management, as well as theoretical aspects, such as human development and behavior theory. The online Human Services degree program provides students with the necessary knowledge and skills to practice in public and private sectors, with a strong understanding and appreciation of the diversity of society and the communities they serve. Students are strongly encouraged to complete an internship as their capstone course, but can make appropriate course substitutions as needed to accommodate full-time working adults. The University of the Cumberlands is accredited by the Southern Association of Colleges and Schools Commission on Colleges. Columbia College ranks among Top 25 on The Best Online Bachelor in Human Services Degree Programs! The Criminal Justice Administration and Human Services Department at Columbia College offers a variety of undergraduate, graduate, and professional programs for students who seek to serve their communities. Part of the School of Humanities, Arts, and Social Sciences, the Department emphasizes career readiness and a balance of practical and theoretical approaches to service. The Criminal Justice Administration and Human Services Department offers an online Bachelor of Arts in Human Services degree program for students seeking to advance their careers in the human services field. The program utilizes core coursework in key areas of human services, including group and family work, diversity and minority cultures and issues, case management, and American social policy. Designed for individuals with experience in the field, students develop the skills necessary to work more effectively in public and private sector human services agencies. Columbia College is accredited by the Higher Learning Commission (HLC). What is a Bachelor's in Human Services Degree? A Human Services Bachelor's degree online focuses on developing the skills and knowledge necessary for individuals to meet the needs of the clients and communities they serve. A online human services degree provides a strong foundation of knowledge in areas such as case management, advocacy, human services administration, minority issues, substance abuse, and family issues. The programs typically blend traditional coursework with internship and/or practicum experiences to give students a balance of theoretical and practical knowledge and skills. Some of the programs include specializations. While related (and often working together), human services and social work differ in key ways. Each field helps people, but with different methods and goals. Social workers tend to help on an individual basis, at the “ground level,” meeting clients and addressing their needs. Social workers work directly with clients to implement social programs. They work directly with clients to help them gain access to services that address their specific problems. Also, some social workers serve as counselors. Human services professionals tend to work on a larger scale, in community-based settings, they often coordinate services and help create programs to serve the needs of a specific population. They often have an administrative role which involves research, planning and supervision. Many human services professionals work in an administrative role to help individuals and communities gain access to basic needs. Human services professionals working in institutional settings, community or residential care may provide direct services such as organizing an activity or leading a group. Some human service professionals serve as advocates for people they serve, in public and political realms, influencing policy and funding to make vital resources more available. According to Payscale.com (2019) , the average annual salary for human service professionals is $39,280. The human services sector basically has two types of jobs: Employees who work directly with clients and employees who provide administrative support for an organization providing human services. Many human services workers with a bachelor's degree spend a lot of time managing client cases. Some of them also provide clinical support. Additional professional certifications can aid in pursuing specific career paths. The National Organization for Human Services (2016) reports the occupational outlook for human services professionals remains high, with a steady need across many fields. According to the Bureau of Labor Statistics, social service occupations enjoy a job growth outlook of 10% from 2014-2024, faster than most occupations. National Organization for Human Services – The NOHS, a membership organization, maintains a commitment to standard of excellence in Human Services, setting ethical guidelines and offering awards and scholarships. Membership includes access to journals and resources published by NOHS, as well as access to conferences and events as well as networking with other human services professionals. NOHS also operates the Human Services Research Institute, advancing research in the field since 1976. American Public Human Services Association – Initially founded in 1930 during the Great Depression, as the American Public Welfare Association, the APHSA works for better lives for children, adults, and families through research, resources, lobbying, and advocacy. Membership with the APHSA comes with the benefits of access to resource and publications, conventions and networking events, and valuable professional affiliations.